The New York State Thruway Authority today released additional information about the amnesty program for Tolls By Mail cashless tolling customers using the Gov. Mario M. Cuomo Bridge. Starting next week, Tolls By Mail customers with open violations will be able to pay their outstanding toll balances on a dedicated webpage by Feb. 26, 2018 to receive amnesty. Once all tolls are paid in full, the violation fees will be waived. Speaking at Thruway offices in Tarrytown on Wednesday, Thruway Authority Acting Executive Director Matthew J. Driscoll discussed the details of the amnesty program as well as a multi-point action plan to increase educational outreach and improve awareness for cashless tolling billing at the Gov. Mario M. Cuomo Bridge, including an account credit to encourage motorists to sign up for E-ZPass. Beginning Monday, Jan. 22, 2018, a new dedicated webpage will allow customers to enter their license plate, state and zip code to determine if they have open violations and how much they owe in tolls. Customers will be able to “Pay Now” with a credit card or print a coupon that they can mail to the Thruway Authority with a check or money order for the tolls they owe by Feb. 26, 2018. Once a customer’s tolls have been paid in full, violation fines and fees will be waived. In early February, eligible motorists will receive a letter from the Thruway Authority with their outstanding toll balances and instructions on how to have their violation fees waived. The Thruway Authority is offering this amnesty program to Tolls By Mail customers with passenger vehicles who have open violations issued between April 24, 2016 through Jan. 31, 2018. These customers include those who were already referred to a collection agency or have had their registration suspended. Customers must pay their entire outstanding toll balance by Feb. 26, 2018 in order to receive amnesty on open violations. Customers who paid their toll bill in full but still have unpaid violations or fees. Customers currently on payment plans (they will not have to make additional payments). Customers currently in registration suspension settlements or those who have been referred to the DMV for registration suspension. Customers with E-ZPass violations or other violations unrelated to the Gov. Mario M. Cuomo Bridge are not eligible for the amnesty program. Installing new roadway signage that more clearly outlines Tolls By Mail payment options and how to avoid late fees and penalties. There are ten signs leading up to the bridge which remind motorists of the toll and/or to call **826 to find out more information on how to pay if you don’t have E-ZPass. Increase E-ZPass awareness through educational outreach to showcase E-ZPass as the most convenient and cost–effective way to travel New York’s toll road, bridges and tunnels. Updating the Thruway App and websites to direct users to update their address with DMV and enhancing the sections about paying tolls and avoiding fees and penalties. Toll By Mail bills are mailed to the registered owner of the vehicle. State law requires individuals to update their addresses within 10 days of moving. Introduce new E-ZPass account credit to encourage Thruway motorists to sign up for an E-ZPass. Customers can purchase an E-ZPass On-the-Go at one of approximately 780 retailers across the state and must register it beginning Thursday, Feb. 1 through Monday, Feb. 26, 2018 - After the customer takes 10 trips on the NYS Thruway in six months, they will receive a $10 credit to their account. Drivers are strongly encouraged to take advantage of the most convenient and cost- effective way to travel New York's roadways, bridges and tunnels by signing up for E-ZPass. With a New York E-ZPass tag, drivers save on tolls across the state, including a five percent discount along the entire 570-mile New York State Thruway. E-ZPass tags are available for purchase at many Thruway Service Areas and approximately 780 retailers across the state. To sign up for an E-ZPass account visit www.E-ZPassNY.com . 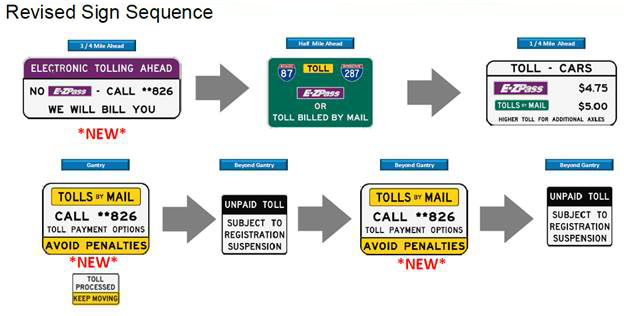 Customers who don’t have an E-ZPass and use the Governor Mario M. Cuomo Bridge can pay their toll before a bill arrives by visiting tollsbymailny.com and pay in a few short steps by providing their license plate number, along with a payment method and period of time traveled. New York State law requires motorists to keep their address current with the Department of Motor Vehicles to ensure bills are mailed to the proper owner. Drivers must update their address with the DMV within 10 days of moving. The New York State Department of Motor Vehicles has enacted a regulation that allows suspension of the vehicle registration of motorists with three or more unpaid tolls, violation fees and other charges resulting from violations on different days, as well as registration suspension of commercial vehicle owners with $200 or more in unpaid tolls and violation fees within a period of five years. Repeated notices are mailed to the registered owner of the vehicle before suspension.